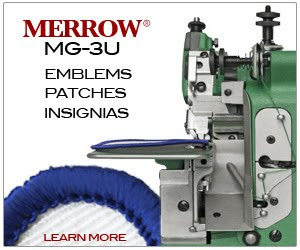 Terrazign and ActiveSeam - Merrow Sewing Machine Co. It's an even rarer treat when you get to sit down and see how these guys work and pick their brains, but that's exactly what we did when they came to the Merrow offices to learn to work the MB-4DFO. Justin tought these guys a thing or two about how to make a great ActiveSeam stitch and I know that they went away impressed with the machine, with Merrow, and with Justin. We're looking forward to meeting up with Bill and Simon down the road to see what types of new applications they come up with for ActiveSeam and the MB-4DFO!